Part one of an occasional series looking at women in the food industry in Perth. Paula Fitzgerald has always had artistic tendencies. In high school she wanted to be a painter but was dismayed by the paltry prices work at art fairs was fetching. She relegated sketching and painting to hobby status and trained as a chef. 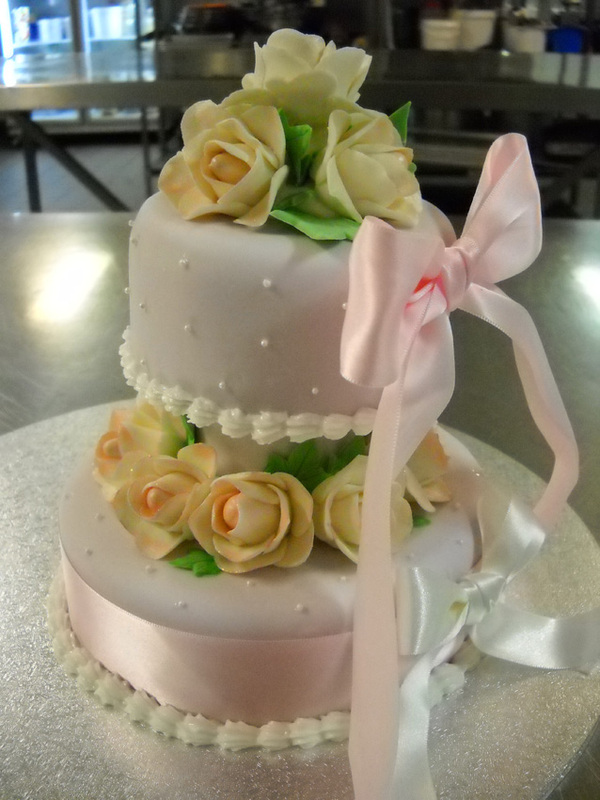 Paula spent time in Devon and Italy and returned to Perth to focus on pastry work. 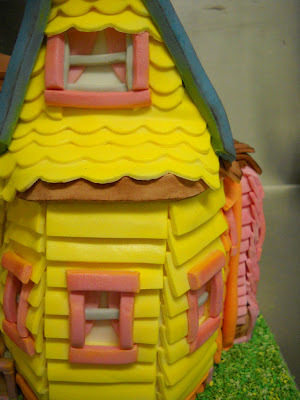 For the last 5 years she has been providing the superior sweet delights for top catering company Comestibles. However, 18 months ago her artistic streak just had to come to the forefront of her work and she launched Caterpillar Bites. From a corner of the Comestibles kitchen in East Perth, Paula does her thing – birthdays and weddings are the chief income earners but as Paula says “once a client has used Caterpillar Bites for a child’s birthday they tend to come back again and again for special occasions throughout the year; work colleagues’ parties, father’s day, Granny and Grandparent’s golden wedding anniversary – it just spirals.” Paula has struck oil during this time of fascination with professional cake decorating, the food network has Ace of Cakes and Cake Boss back to back on virtual rotation. A professionally decorated cake is recognised as an expression of creativity and dedication and the smartest move a host can make, not just the crumbly, sticky end of the meal. So what makes Paula F itzgerald and Caterpillar Bites different? 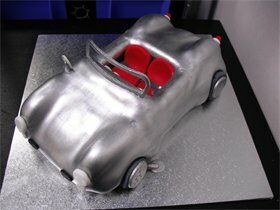 On her website we can see her vast range of designs: Cheeky Devil Care Bare, Pink Tiara for girls and for boys Yoda and a Rusty VW Beetle amongst the Thomas the Tank Engines and even silver porsche spyder with red leather upholstery. “Anyone can decorate a cake, it just depends to what standard.” Paula takes her business very seriously – she is off to the UK to train with Debbie Brown, the undisputed Empress of Innovative Cake Design “I’ve waited for 5 years to get a place on one of her courses, this is the ultimate learning experience. Debbie’s work is clean with a crisp finish, it is flawless,” Paula tells me. “I want to learn all the secrets of the art.” Debbie Brown, whom Paula describes as the supreme cake decorating icon started small, from home and was in the right place at the right time to bring the art thundering into the commercial arena and get in first on a series of best-selling how-to books. Paula appreciates this set of business skills. There are plenty of women who do sugar craft as a hobby, offering to make an Optimus Prime Transformer cake for their nephew’s birthday, shutting themselves away for 8 days, fingers stained with red and blue and eyes crossed with the effort of replicating the right engine grill in fondant. They emerge frazzled and find it hard to emotionally detach from an item that will ultimately be devoured. Paula is a pragmatist who has found her calling and woven it in with her strong business sense. Paula is a true artist as she makes time to explore and focus on craftmanship and techinique, expanding ideas and trialing new methods. 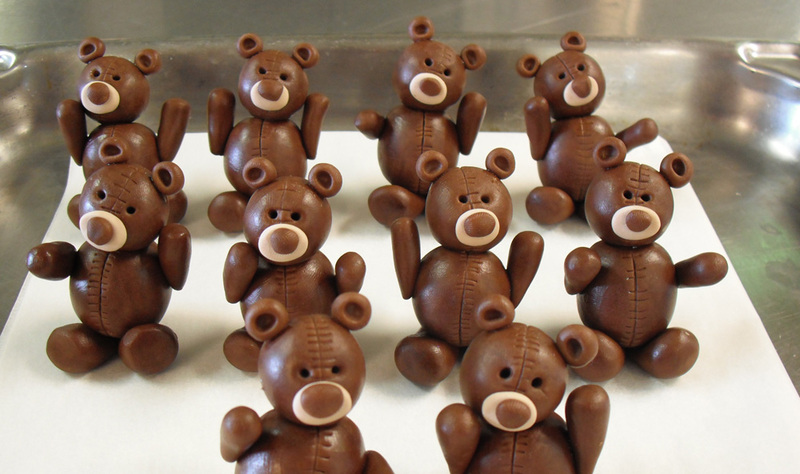 This parade-ground of chocolate teddies was made for pleasure. She found the chocolate fondant in a cake supplies shop and began practising. She made more and more, the teddies multiplied and with each one a techinique was honed: the stitched effect on the seams, the slightly different expressive position of the arms makes each one an individual. Paula gets much of her inspiration from ceramics and figurines as sugar works structurally in much the same way. Paula charges properly for her time and she has never had a disappointed customer. 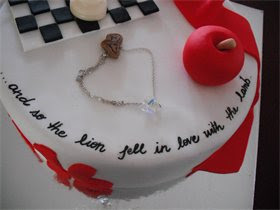 “I’ve learned not to cave in should a client’s face fall at the point of delivery – $300 for a cake!” The cost of Paula’s time is used on design, sometimes in collaboration with the customer, details, baking, assembling, decorating, details, delivery and installation often with as much care as an art gallery curator. Did she mention the attention to detail? 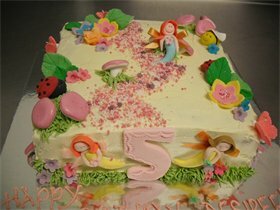 “I never let a cake leave the kitchen without a little hand-painted detail, be it lustre dust for the shaping on a duck’s beak or the roses on a mermaid’s cheek,” confrims Paula. 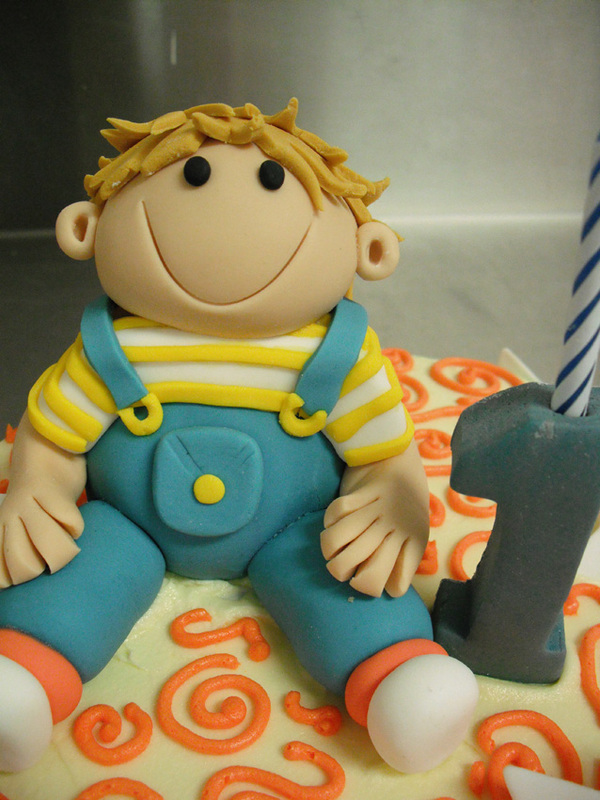 She prides herself on being precise in the details, for each client they are personalised even down to the hair colour and outfit of the birthday child. Along with a true respect for the discipline of cake decorating Paula’s business gives space to her naturally caring side. On her website she reassures clients that she will take care of dietary requirements, delivery and make sure the client sits back and enjoys the party. “I think parties should be memorable and fun for both parents and children,” she declares. “A stressed hostess is likely to be a snappy hostess and it’s my role to take that stress away.” Not only will Paula’s service dissolve anxiety but it will cast a serene, shimmering glow of limelight in which the hostess can bask, reflected perfectly in Paula’s talent. Once the cake is in situ and has drawn coos of wonder and admiration from the guests, all of which the host can absorb, and then been photographed with cake honouree, cut, cooed over a whole lot more and eaten, the guests’ pictures up-loaded to Facebook and Twitter , the cost is really quite modest considering the high mileage of pleasure the cake gives through all stages of its life. Paula is thinking of the future of Caterpillar Bites and it will get expensive in the short-term. Light industrial units and equipment are costly yet in the long-term Paula is confident her product can deliver enough returns to succeed. “Many women in small businesses have sold themselves short and cut costs only to find they are shooting themselves in the foot. I know my service has real value and I want to keep improving that.” Does this mean more staff and delegation and, dare I say it, a dilution of control? “I’d happily have someone else waiting 2.5 hours in the kitchen for a mud cake to bake, but all the cake recipes are my own and I will not compromise on quality if I’m going to put my name to something,” Paula says firmly.